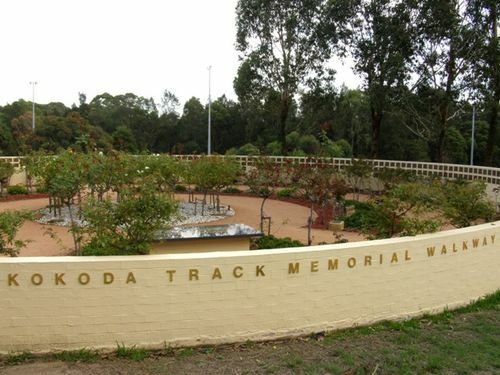 The Kokoda Track Memorial Rose Garden marks the start of the Walkway and contains plaques to the units who served during World War Two as well as individual plaques to those who served. The Kokoda Track Memorial Walkway is a unique tribute to the bravery of Australian troops who fought through atrocious conditions and against vastly superior enemy numbers in the Papua-New Guinea campaign of July 1942-January 1943. The Kokoda Track Memorial Walkway covers more than 800 metres from Rhodes Station to Concord Hospital in Sydney's inner-west, and runs along the mangrove-studded shores of Brays Bay on the Parramatta River. At the centrepiece of the Walkway are magnificent granite walls bearing photographic images of the Kokoda campaign. There are 22 audio-visual stations along the Walkway, each describing a significant place or military engagement. The Walkway has been planted with lush tropical vegetation simulating the conditions of The Kokoda Track. During World War Two, with United States support the Australians inflicted on the Japanese Imperial Army its first defeat. The fighting on The Kokoda Track was one of the vital elements which saved Australia from invasion in World War Two. The Papua campaign, including The Kokoda Track, Milne Bay, Buna, Gona and Sanananda resulted in total Australian and United States casualties of 8546. Casualties from malaria were more than 27,000 and from tropical diseases at least 37,000. More than 2000 Australians and 600 Americans were killed. During the four months of fighting in the Owen Stanley Ranges the Australian infantry lost 607 killed and 1015 wounded. This Memorial Rose Garden marks the start of the Kokoda Track Memorial Walkway. The Walkway commemorates the herculean efforts in the 1942 -1943 Papuan campaign of the Australians, who with the support of the Papuans (''Fuzzy Wuzzies'') kept Australia secure from invasion. Here we honour the compassionate care provided by the Medical Corps and Nursing Services to the casualties of all areas of conflict.